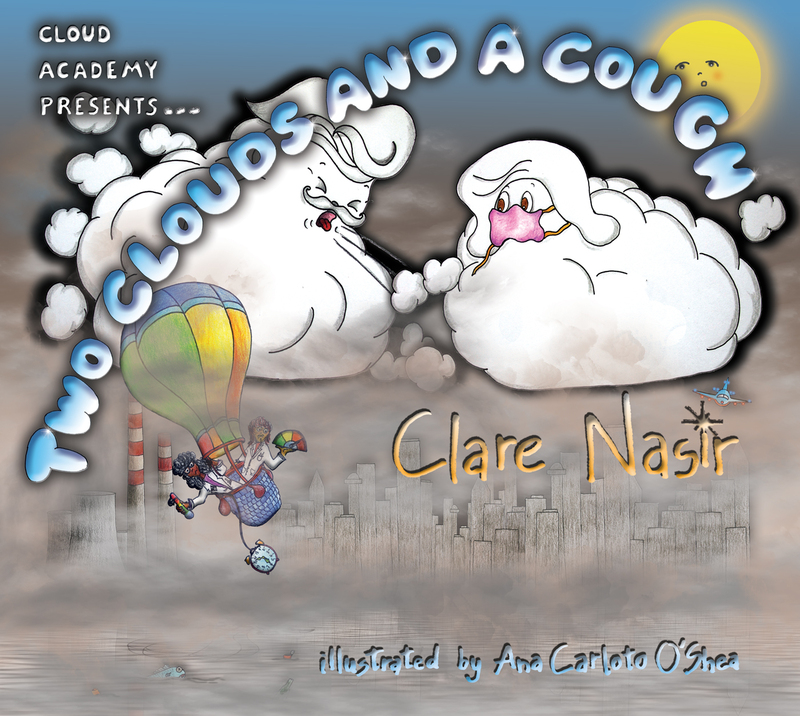 Clare Nasir and illustrator Ana Carloto O’Shea present the Cloud Academy Series Book 4, a funny and insightful story tackling the issue of air pollution. We meet two old clouds, Lil and Mick, who live above a city. The city has changed over the years and now the air is choked with dirt – which makes Mick cough and Lil snore. These two bickering clouds watch with interest as an angry crowd below demand their Lady Mayor cleans up the air. The imaginative and strong minded Mayor is about to embark on a mission to change both the lives of the people and the clouds with excellent results for everyone. Two Clouds and a Cough is a beautifully illustrated tale focusing on weather, the environment and some clever snippets of science. The learning pages highlight the science behind air pollution and how to read different types of measurements such as temperature and air quality. Clare’s previous titles include Colin the Cloud – with the learning pages focusing on thunderstorms; Steve the Stratus – the composition of clouds, mist and fog and The Showbiz Clouds – the seasons and snow. The Cloud Academy Series is a set of rhyming stories for 4 to 7 year olds. As well as being packed full of adventures of clouds across the sky, they have key learning points about weather and simple, yet clever atmospheric physics. Clare’s meteorological expertise, journalistic experience, coupled with being a mum of a six year old; bring the elements of storytelling and solid science together. Two Clouds and a Cough is endorsed by the Healthy Air Campaign. A fully qualified, Met office trained, weather forecaster with 20 years’ experience, Clare’s first love has always been weather and science. She has a degree in Maths, Masters in Oceanography and a Diploma in Environmental Policy. During her ten years as GMTV’s weather anchor she was in charge of the output and production for science and weather stories. Today Clare presents on BBC North West and BBC North. She recently co-presented the much-acclaimed children’s science documentary series Fierce Earth for CBBC, now in its second series. She writes regularly for the Huffington Post on science and weather, and many other newspapers and magazines, including First News, the children’s newspaper. Clare is the ambassador for the National Healthy Air Campaign, this involves working closely with environmental law firm, Client Earth, and speaking for the campaign at the House of Lords as well as other events and press interviews. She is also an ambassador for the Princes Trust. Clare lives in Manchester with her husband and 6-year-old daughter Sienna. She is a proud member of the Cloud Appreciation Society and talks regularly at schools about weather, science and motivational issues.